Steve Conger at The Gamesman posted a great interview with Vector Unit's Matt Small and Ralf Knoesel. 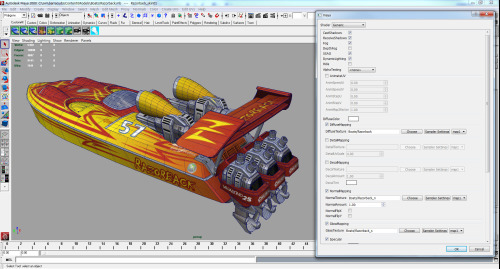 Get a behind the scenes look at the development of Riptide GP and Hydro Thunder Hurricane, and learn a little more about the indie game development roller coaster. It's really a pleasure for us to talk with someone like Steve who's genuinely interested in the process of game development. Hopefully this discussion can give people thinking of starting their own business a little more insight into what it takes and how to go about it. Our in-depth look at "what went right" and "what went wrong" during the development of Hydro Thunder Hurricane is now up on Gamasutra. We love reading developer Postmortems, at least the ones that don't BS around too much and actually fess up. We tried to be as candid as possible in this one, and at the same time give a little perspective on what it's like making the switch from working for a big company to running your own studio. When we started Vector Unit, we figured the experience we had as leads managing large teams at established game development studios would scale smoothly to the development of a smaller game project. If anything, we thought, it would be easier -- fewer moving parts. To some extent that ended up being true. What we didn't count on were the countless small surprises that small game development had in store for us. There's a pretty in-depth interview with HTH's creative director Matt Small at XBLA Fans today. Thanks to interviewer Miguel Coelho for asking more "out of the box" questions that your typical interview. The conversation ranges from descriptions of the new Tempest Pack tracks to the design process for new levels, to just why are those Expert Ring Master courses so damn hard?!? Read the full interview here: Tempest Incoming -- An Interview with Vector Unit's Matt Small. J2Games has an in-depth interview with Hydro Thunder Hurricane's Creative Director Matt Small, featuring tons of behind the scenes info about the making of the game. Gamer blog SideQuesting has posted an interview with Vector Unit Creative Director Matt Small, discussing Hydro Thunder Hurricane. Blogger and noted Hydro Thunder fan Noe Valladolid has posted a lengthy interview with Technical Director Ralf Knoesel and a preview of Hydro Thunder Hurricane at 1up, including some new screenshots. Two new interviews have been posted today on web sites Gamasutra and GamePlayBook, both with Creative Director Matt Small discussing Vector Unit's recently announced XBLA title Hydro Thunder Hurricane. The Gamasutra article is based on an in-person interview conducted by reporter Chris Remo. Chris and Matt took some time aside at PAX East to discuss the finer points of indie game development and strategies for adapting a high profile license like Hydro Thunder to XBLA. The GamePlayBook piece focuses more on the specifics of HTH's game play features, and dives into deeper detail regarding our game design strategies, thoughts on the Hydro Thunder franchise, and the work that went into developing our dynamic water simulation.